Welcome to the SPD family! Spartanburg Pediatric Dentistry has been providing all of Spartanburg as well as surrounding areas as their dental home since 2010! Here at SPD, our goal is to treat you and your children as our own family. We strive to exceed your expectations and provide you with the best dental care imaginable. We are committed to helping your children feel comfortable and relaxed with our experienced staff. We care about your children and want them to see just how fun going to the dentist can be! What’s fun about going to the dentist, you may ask? THE DOGS OF COURSE! You read correctly! Our office has 2 dogs, Yazzy and Taco, who come to work every day just to soothe children before and/or after their appointment. 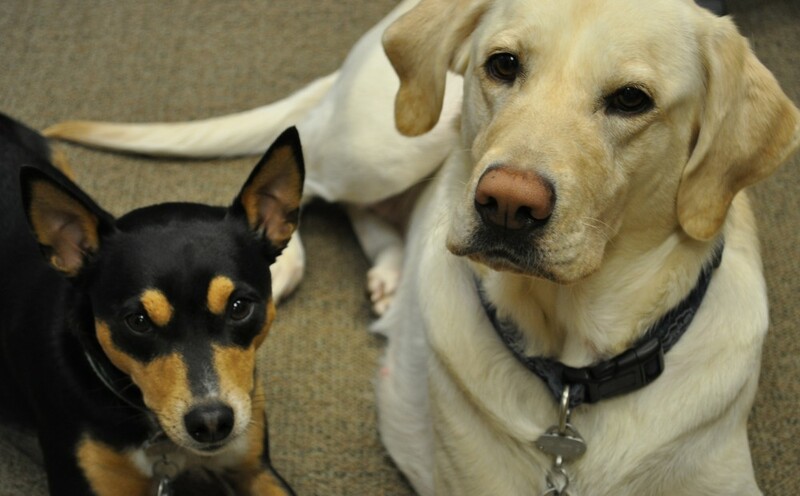 Yazzy is a fun, loving, yellow lab and Taco is a hybrid mix of awesomeness. Afraid of dogs? No worries! They stay behind a gate and don’t make a sound. So come on by, take a seat, and don’t forget to bring a treat!